John Playford's Dancing Master first published in 1651 is a wonderful example of crossover music genres. 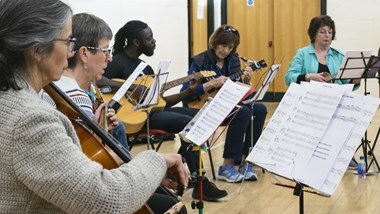 Featuring Purcell alongside English country dance tunes and strains of European music this is a course where all players, from traditional, classical or jazz backgrounds can come and enjoy themselves. The course will open up these dance tunes through new arrangements, improvisational and compositional techniques with a view to playing them for dancing. Come and explore this wonderful musical heritage, play in a variety of ensembles and experiment along the way. All instruments welcome. Included in the fee is a public concert given by Paul and Karen on the first evening.